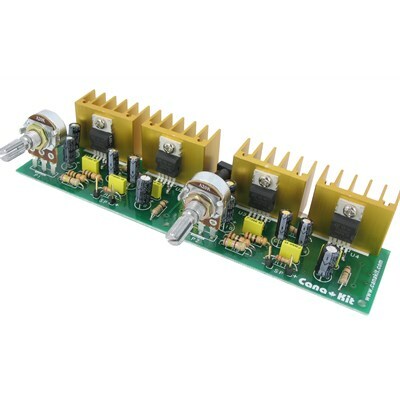 This stereo audio amplifier consists of two separate 20W bridged power amplifiers (one for each channel) based on four TDA2003 monolithic Integrated Circuits connected in bridged configuration to deliver more than 40W of music power into a pair of 4 Ohm speakers. Running on 12V DC, this stereo amplifier is ideal for the car to boost the audio power of older audio systems or to add two more speakers. In addition, it can be connected to any stereo audio source such an iPod, iPhone or any other portable media or MP3 player.